UA officially breaks ground on a $10 million facility for adapted athletics. 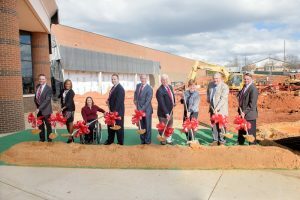 TUSCALOOSA, Ala. – The future home of The University of Alabama’s Adapted Athletics programs has begun to take shape. UA officially broke ground on the $10 million facility Thursday, Feb. 23, as UA President Stuart R. Bell and Adapted Athletics Director Dr. Brent Hardin recognized supporters during a ceremony at the site, which is located along the south façade of the UA Rec Center, east of the main entrance. The two-story facility will include a NCAA regulation game venue for wheelchair basketball, locker rooms, workout/training room, strength and conditioning room, team meeting rooms and study halls. Construction is scheduled to finish in late Fall 2017. The UA Adapted Athletics Program began in 2003 with women’s wheelchair basketball. The program has since grown to include 30 student-athletes in women’s basketball, men’s basketball, wheelchair tennis, para-rowing and adapted golf. UA is home to five national championships in men’s and women’s wheelchair basketball (2009, 2010, 2011, 2013, 2015). Wheelchair tennis has won two national championships (2013, 2015). “This facility will be the first of its kind in the United States and makes a very important statement about how our university values student-athletes with disabilities and persons with disabilities in general,” Hardin said. The UA System Board of Trustees approved a $10 million budget for the facility in January 2016. Per the approval, half of the budget was to be raised through private gifts. The fundraising campaign received a significant boost when Mike and Kathy Mouron, UA alumni and Mountain Brook residents, committed a $3 million gift toward the project in February 2016. More than 20 UA student-athletes and coaches participated in the 2016 Paralympic Games in Rio. With the help of four former UA players and coaches, both the United States’ men’s and women’s teams won gold medals in wheelchair basketball at Rio. One former player and a current player, Babsi Gross, helped lead Germany to a silver medal in women’s wheelchair basketball. UA’s men’s and women’s wheelchair basketball teams will conclude their respective seasons in the Collegiate Classic, which begins Friday at The Rec. The tournament’s main events will be held Saturday, Feb. 25, at Foster Auditorium. The UA women’s team will face the University of Illinois at 5:30 p.m., followed by the UA men facing Illinois at 7:30 p.m. More information can be found here.